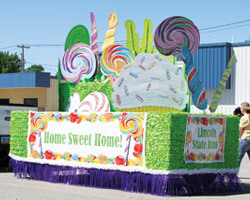 Building a parade float is much easier than you may think! With just a bit of effort and our dynamic materials, you’ll have a float to be proud of in no time. Whether you choose your own combination of our floral sheeting, fringe and twist or a complete float kit, you are sure to be happy with the results. When you think parade float decorating, think vinyl floral sheeting. This rolled material has sparkle, dimension and texture. Use it to cover a trailer bed, the tow vehicle or areas of a prop. 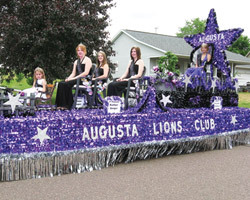 Our premium Metallic Floral Sheeting adds extra flair to a parade float by providing a rich appearance to your creation. Our 3-foot wide sheeting comes in 30 foot rolls for easy handling. 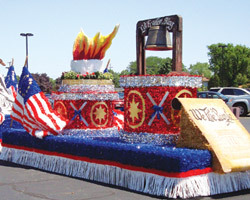 Download our Parade Floats How To Book today!